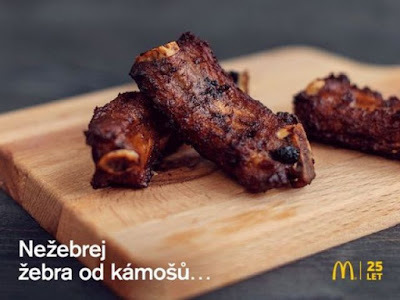 As part of a limited-time, barbecue-themed menu, McDonald's is offering ribs over in the Czech Republic. The bone-in pork ribs come three to an order and are joined on the menu by the Big Tasty Bacon and Big BBQ Bacon. The ribs come with a choice of sauce for dipping but, sadly, are not called McRibs (most likely due to the sandwich of the same name). Photo via McDonald's Czech Republic.